Vyse Street is one of the main thoroughfares of the Jewelry Quarter. Stroll through and you will find art and antique stores as well as scores of jewelry shops. The glittering window displays coupled with the Victorian facades of the shops makes for an interesting experience. 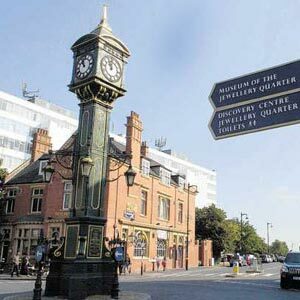 Warstone Lane and Frederick Street allow you a glimpse of the famous landmark of Birmingham's Jewelry Quarter - The Chamberlain Clock. The Big Peg is a modern office block situated in the Jewelry Quarter of Birmingham. Built in 1960, it was a common space for hundreds of jewelry workers. Today, it also houses creative enterprises and arts and media agencies. There has been increased restorative and conservation work being carried out in the Jewelry Quarter since the 1980s. It is also one of the Prince Foundation's heritage initiatives. Nearly ?250 million has been invested in the redevelopment of this part of the city. It is now home to thousands of people and also boasts of new cultural facilities. The manufacturing of jewelry is still retained within this quarter.